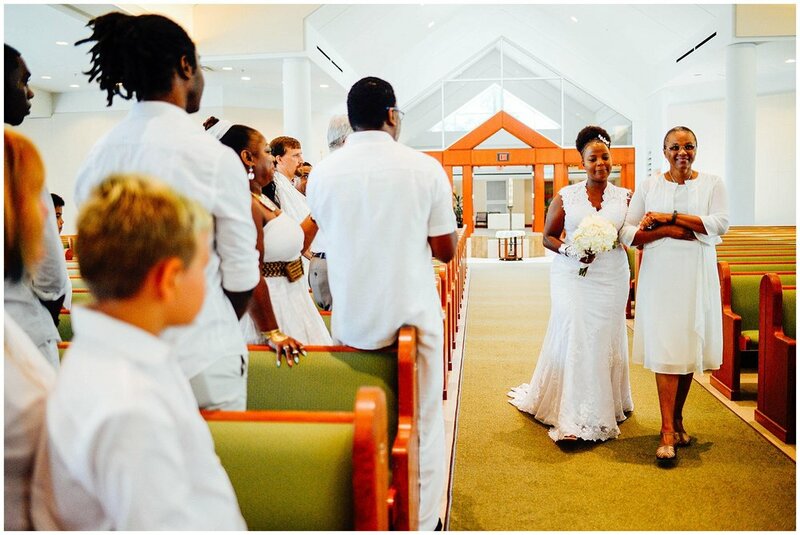 Edith and Bomani met in 2008 at Edith's workplace in Kenya and it was love at first sight. They had a long distance relationship for many years, and spent hours talking on Skype and the phone. Throughout their relationship, it was evident that Edith and Bomani were meant to be together. From thousands of miles away, Bomani wooed Edith; Bomani sent Edith flowers and gifts, and would surprise her with occasional visits. A few years later, they reached a turning point in their lives and had to prayerfully consider the direction in which their courtship was going. They turned to Jesus through the intercession of St. Faustina, the patron Saint of their relationship, and her famous prayer: "Jesus, I trust in You." It was a prayer of intense and complete surrender, difficult to say and even harder to live by, but Edith and Bomani knew deep down that God had a plan for their lives together. And despite some scary moments in their families, it came to pass. Bomani came to Kenya and asked for Edith's hand in marriage. 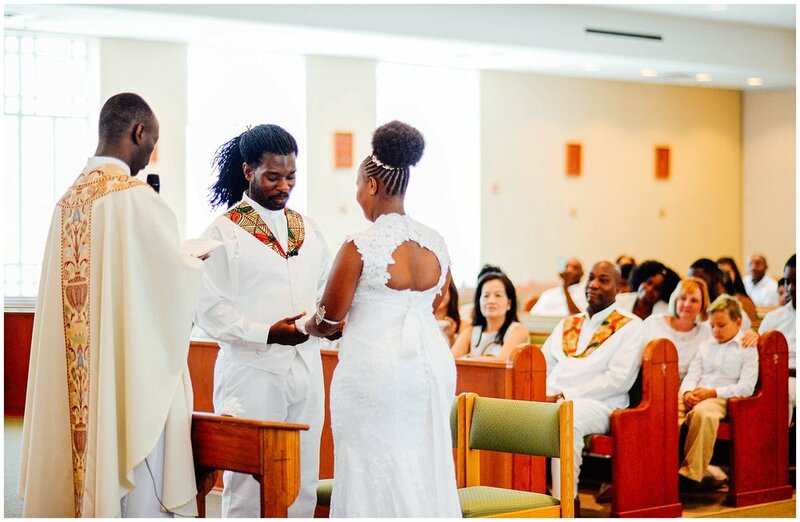 She moved to the United States and they got married in a joyous nupital Mass celebration at St. Ann's Roman Catholic Church in Arlington, VA.
From the photographer: The Wedding Mass of Edith and Bomani was unlike any Mass I have ever witnessed. It was vibrant, celebratory, and full of joy! 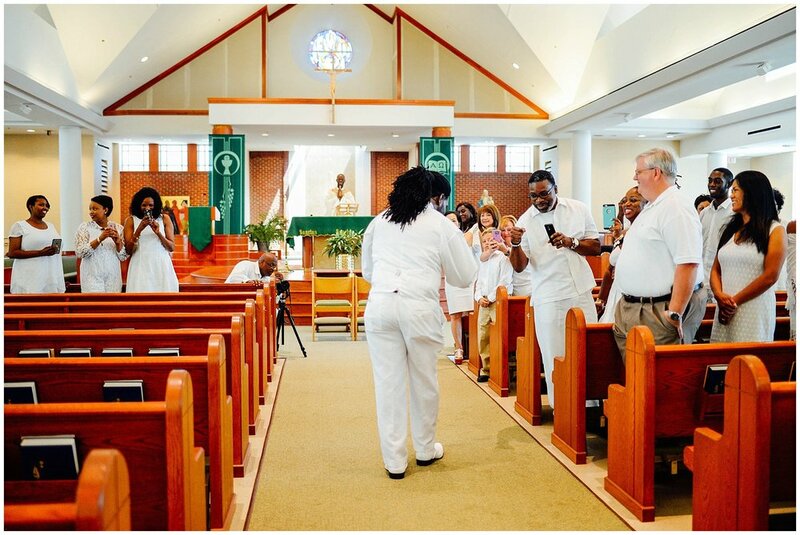 After making a reverent sign of the Cross and blessing themselves with Holy Water, the groom and wedding party danced their way up the aisle to the front of the sanctuary. The music was a combination of Kenyan Gospel music and Afro-Carribean beats. 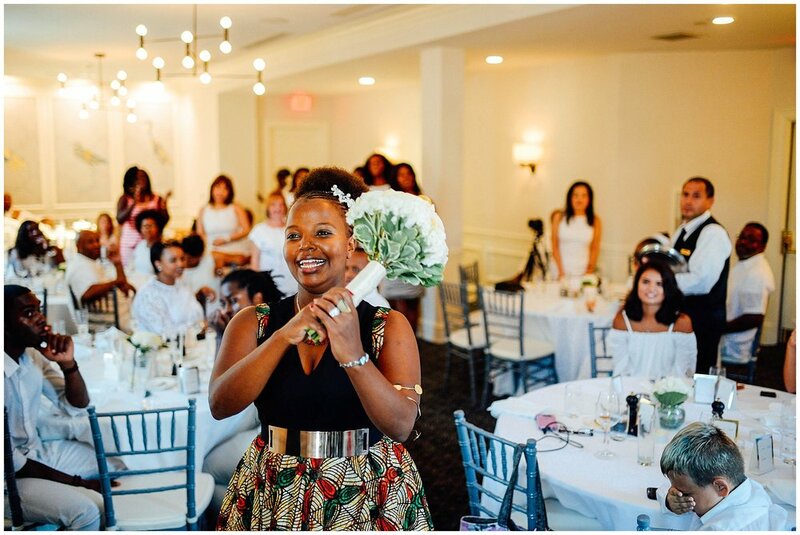 Since her parents could not be with her on her wedding day (as they live in Kenya), Edith took one emotional walk down the aisle and her Aunt gave her away to Bomani. After the readings, saying their vows, the sign of peace, Holy Communion (which was not photographed per the Bride and Groom's request), the young Priest presiding over the Mass declared that today was not only a celebration for Edith and Bomani, but also a celebration of the guests' milestones. He asked if anyone was celebrating an anniversary, engagement, birthday, baptism during the month of August, and when we raised our hands (I raised my hand because my birthday was just one week prior to that celebration), the music played and everyone cheered. You could not help but be overwhelmed with tears of joy and laughter! The attire the wedding guests was also unique in that it was "white-on-white", both a timeless and seasonably appropriate color for a late summer Afro-Caribbean wedding. 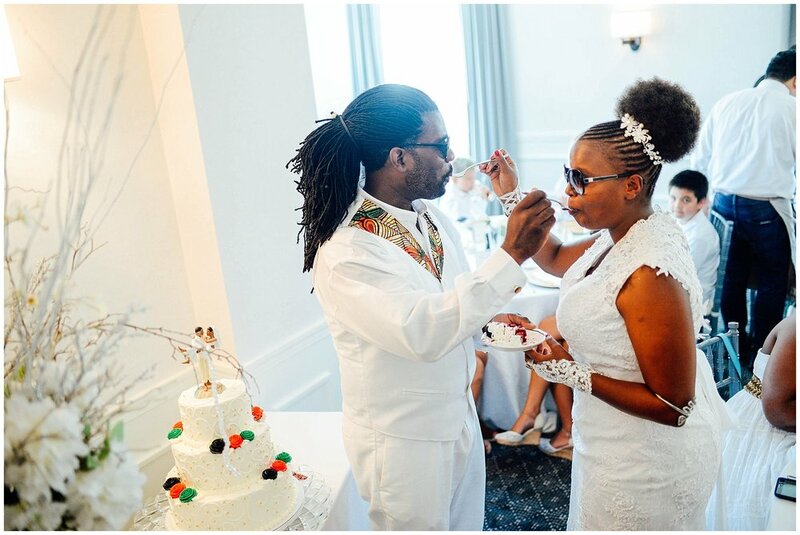 Edith had a traditional wedding dress on during the ceremony while Bomani had a traditional Kenyan wedding suit on. 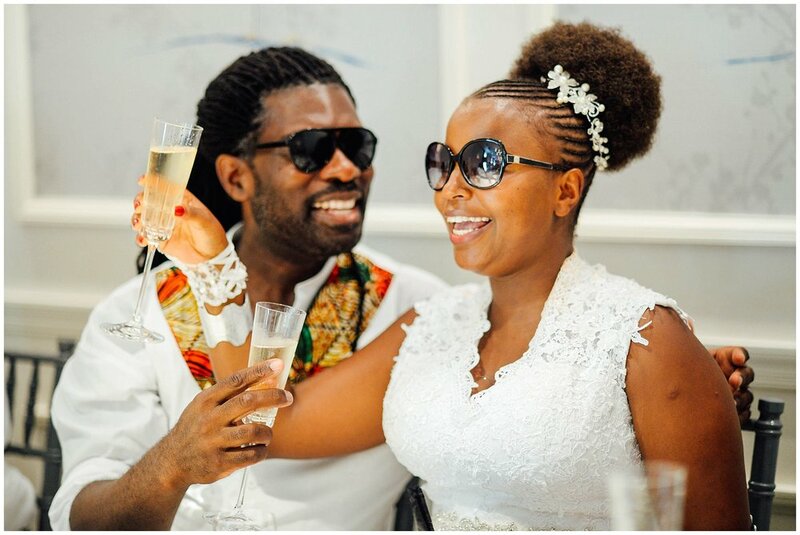 At the reception, both Edith and Bomani changed into a more casual traditional Kenyan outfit (black with bold reds, greens and gold patterns) and that contrasted nicely with the white dresses and suits of the wedding guests. 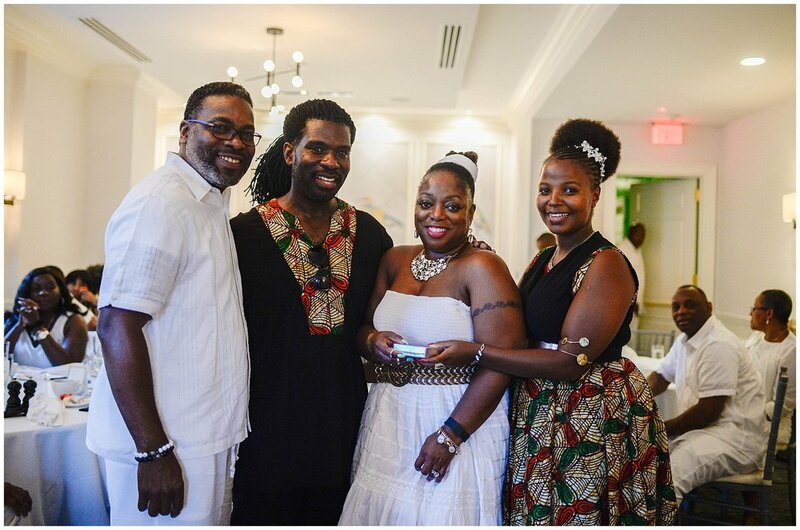 The wedding reception took place at an historic boutique hotel in Old Town Alexandria, VA, which is a mix of contemporary and colonial decor.The ballroom was the perfect location for a small intimate wedding of 50 people. After the bride and groom made their grand entrance (dancing, of course! 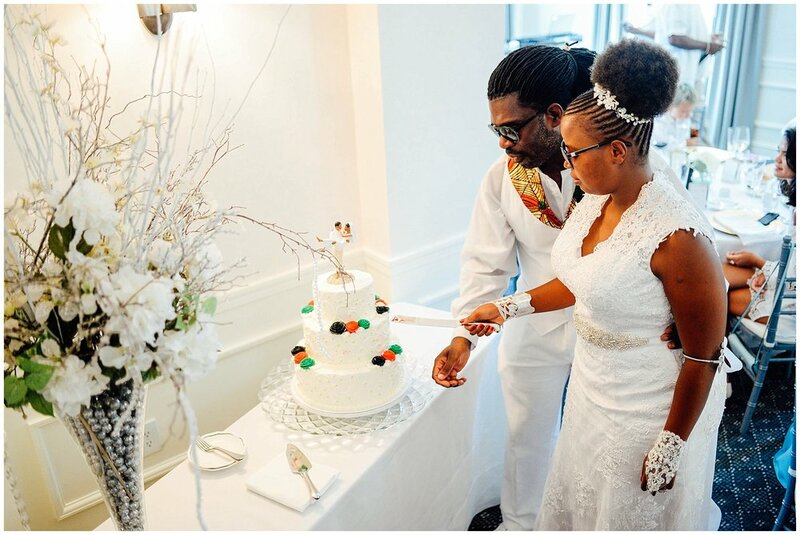 ), they participated in a variety of wedding reception activities, such as cutting and serving each other the delicious 3-tier wedding cake, listening to speeches and well wishes from family and friends, and giving their own speech of thanksgiving and gratitude to their guests and the traditional gift giving ceremony. 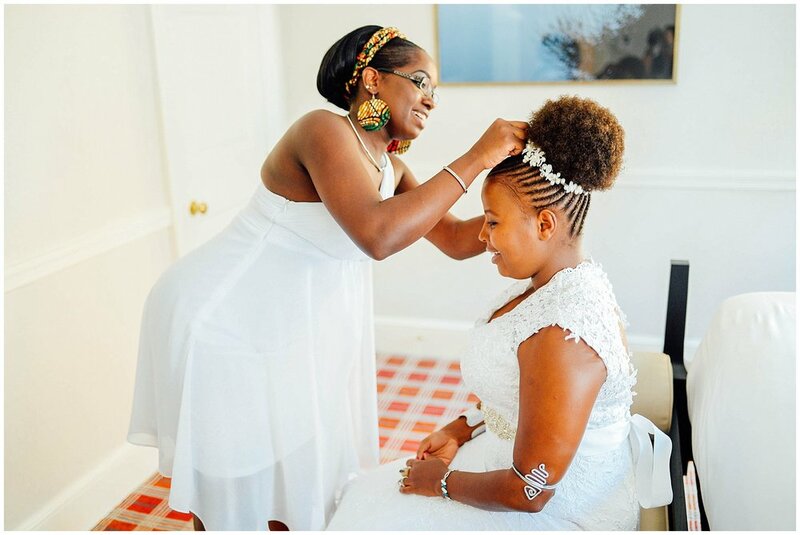 In Kenya, it is a tradition to not only receive gifts for their wedding, but also to give gifts to each guest that attends the wedding. 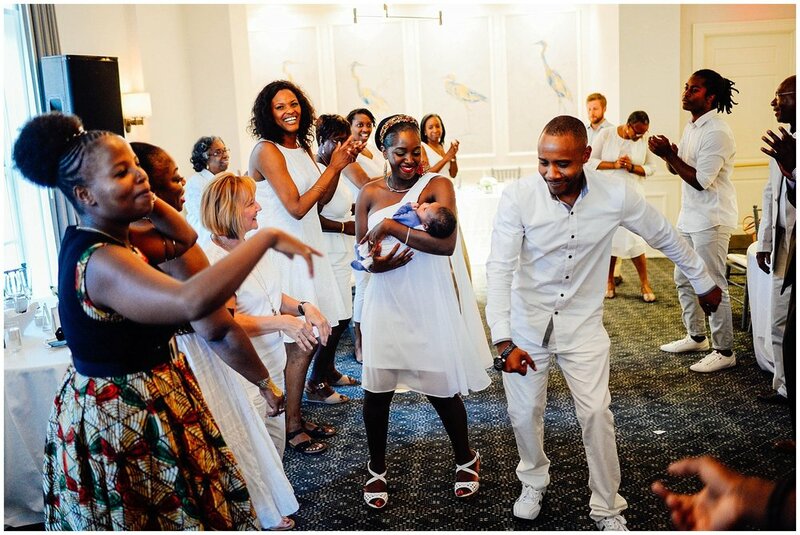 As the music played, the couple and their guests danced together before posing for a picture and giving each guest their gift. This wedding also featured one of the best grand finale photo moments of any wedding I have photographed thus far. We used the curved staircase of the Morrison House Hotel and had everyone go outside for a photo opt: first a traditional/editorial pose and lastly, the "scream and shout" pose where Edith and Bomani shared one of their first kisses (dressed in traditional Kenyan colors) and as Mr. and Mrs. while the wedding guests (wearing white) cheered on! 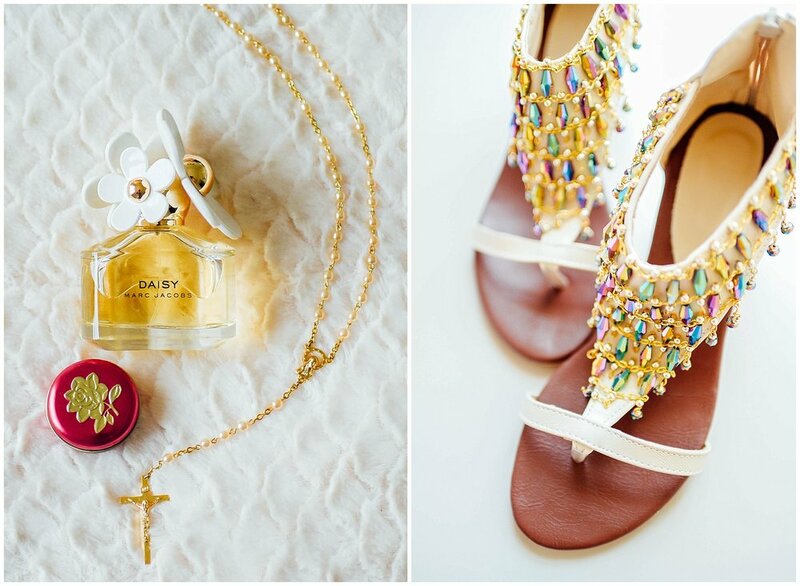 What is your spiritual takeaway from this wedding? 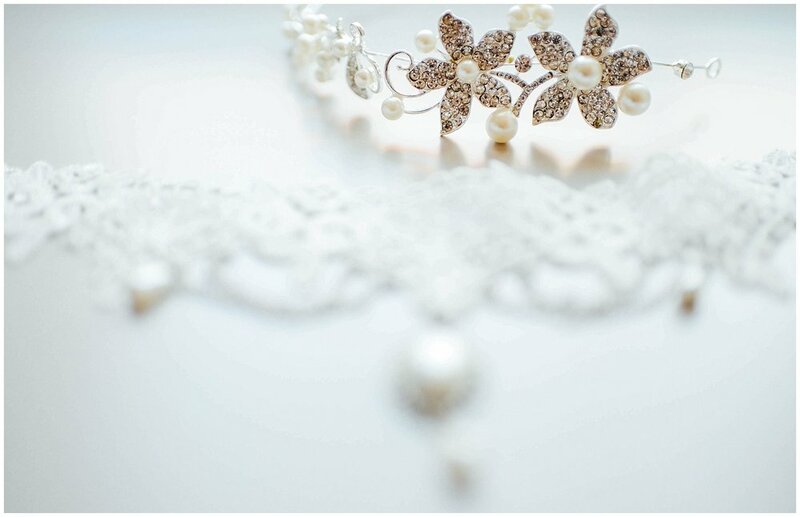 From a vendor's perspective, this wedding brought tears to my eyes. It was encouraging for me to see the diversity within the Catholicism that comes from cultures in the developing world and that it is a gift to share in these traditions. Though we are so different in many ways, we are one Body in Christ and that is something to celebrate and treasure. Edith and Bomani's journey of faith and love also showed me that when you truly surrender your life to Jesus, in whatever vocation you might find yourself in, all things are possible in His perfect time. And when all else fails? Just dance, and make a joyful noise unto the Lord!